Heading home with the clubhouse in the distance, the eighteenth is a challenging par 4. Water introduced off the tee and a fairway bunker on the right, framed with trees on the left, your position on this generous fairway is important to have the best shot into the green. The green is well protected by a running stream of emerald blue water and white sand bunkers that challenge every golfing ability. A tough finishing hole that will make you earn your cold drink in our clubhouse to reflect on your golf experience at Emerald Lakes. Safe Play: Tee off with a fairway wood down the right hand side of the fairway, from this angle it will open up the green, you can hit a middle iron to the right side on the green away from the bunkers on the left and two putt for par. 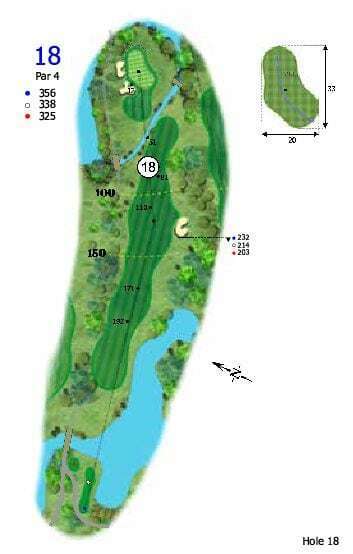 Aggressive Play: Teeing off with driver down the left side of the fairway will leave you only a short iron or wedge into the green, attack the pin with your approach shot and make your birdie putt.